Browsing the menu took some time as there were so many new dishes on the menu that I was tempted to try, I was also pleased to see there was a lot more healthier options available too as I am trying to be halthier in the lead up to my upcoming wedding. 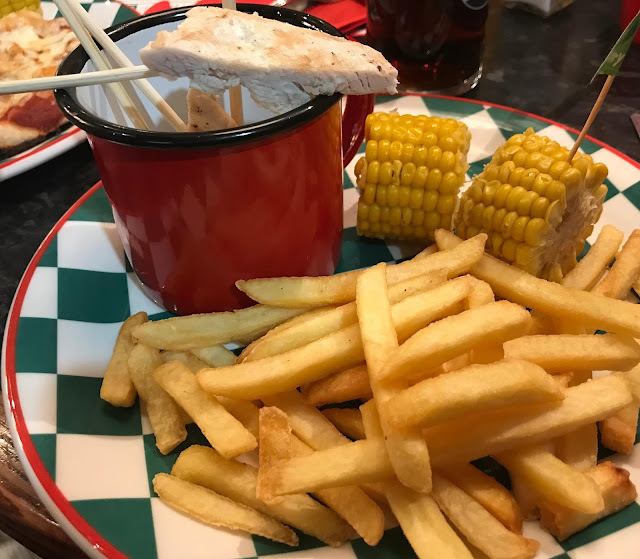 We all decided to order starters, Garlic bread from the children's menu for the little two (99p each), Southern fried chicken strips (£5.99) for myself and teen and Nashville chicken skewers for the other half (£5.79). 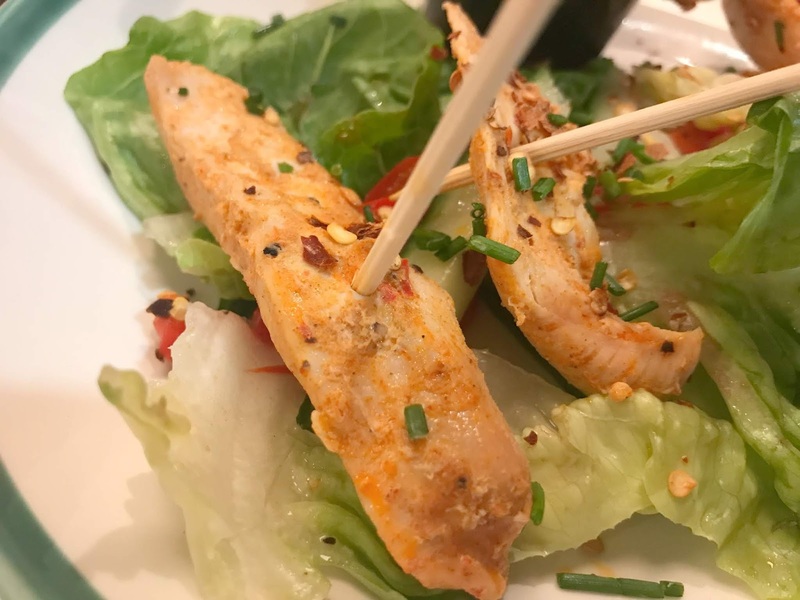 The food arrived quickly, the other half was a bit disappointed with his chicken skewers as they were a fairly small portion, however, they were off the new feel good menu so it was to be expected. 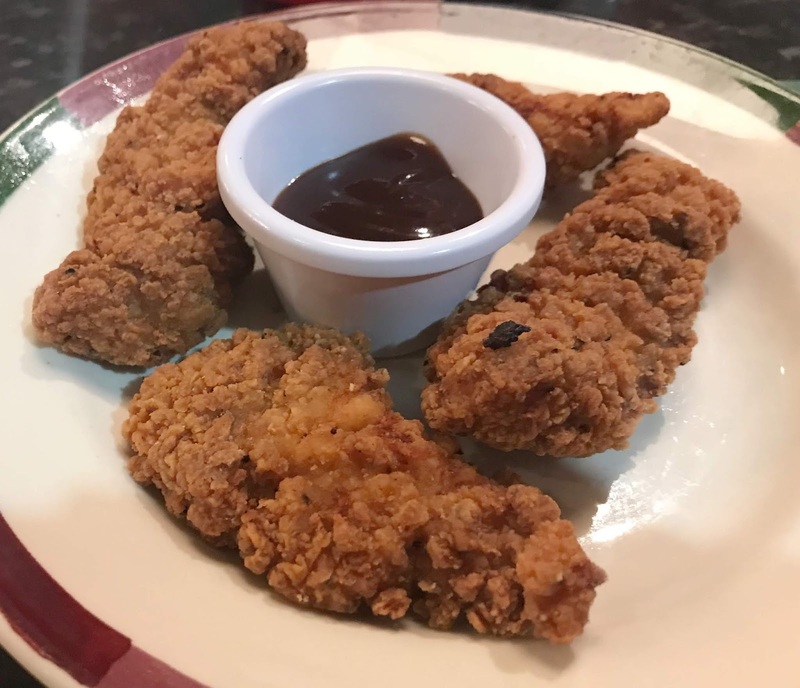 The Southern Fried Chicken strips are something that I get every time we visit Frankie & Bennys so I was not disappointed as I know how good they are (so much for the pre-wedding diet), I especially enjoy the BBQ dipping sauce but I do miss the salad they used to come with. Onto mains and the little two ordered from the children's menu which is just £4.99 for one of the smaller menus and consists of a main, two sides, drink and dessert. They are the perfect size for my four and five-year-olds, slightly older children can order from the big eater's section of the children menu for £7.49 for a main, dessert and drink. 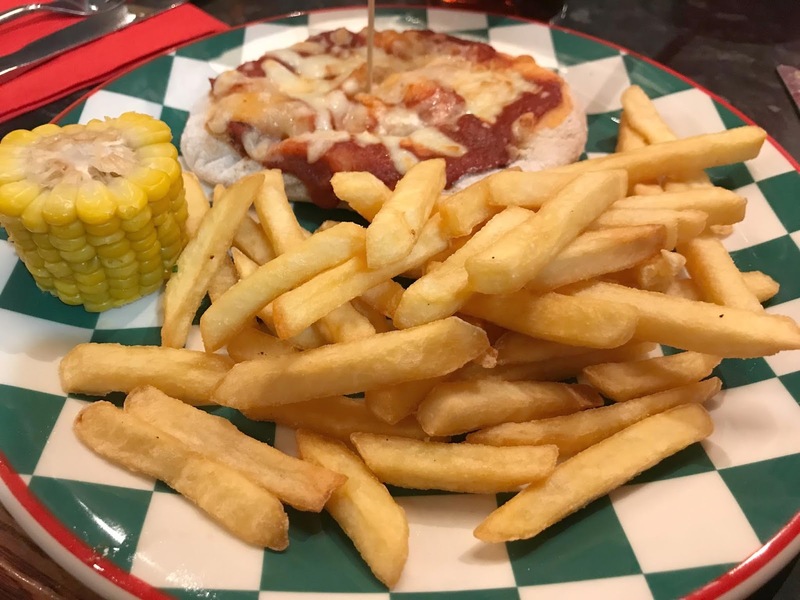 Sophia (aged 5) is a really fussy eater so we ordered her the pizza, fries and corn on the cob for her main. She really enjoyed it and ate the lot, she especially liked the pizza eating every single slice. Jacob wanted the mini grilled chicken skewers and again ordered sides of fries and corn on the cob to go with his meal. He really enjoyed eating his chicken on a stick as he called it, both children really enjoyed their meals and we were shocked at how much they actually managed to eat. My teen went for the Chilli Cheeseburger (£11.99) which is new to the menu and came with a side of fries and a pot of mayo on the side. 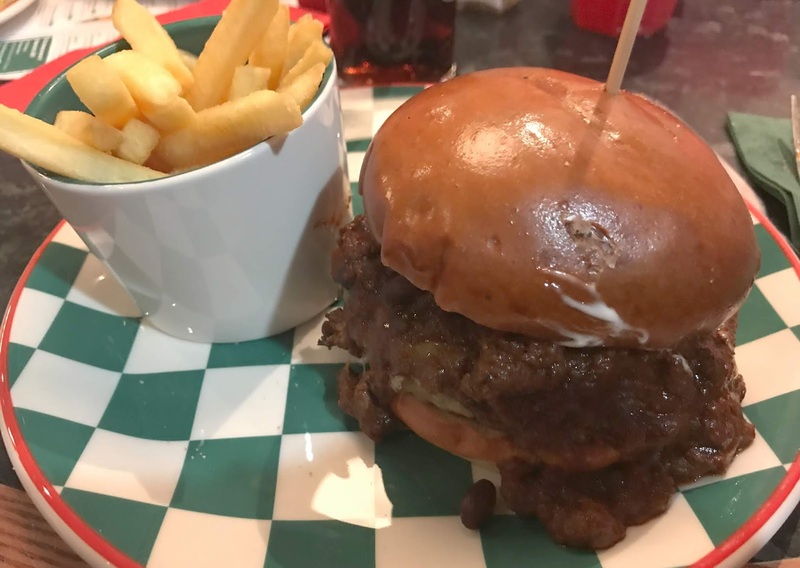 The burger was a 6oz beef burger topped with beef chilli con carne, Monterey Jack cheese and mayo. She enjoyed her burger although she could not eat all of it as she found it so filling. I was so tempted to order something from the new menu but typically I ordered what I always do when I eat at Frankie & Benny's - as I love them, I ordered the BBQ Chicken wrap (£11.29). 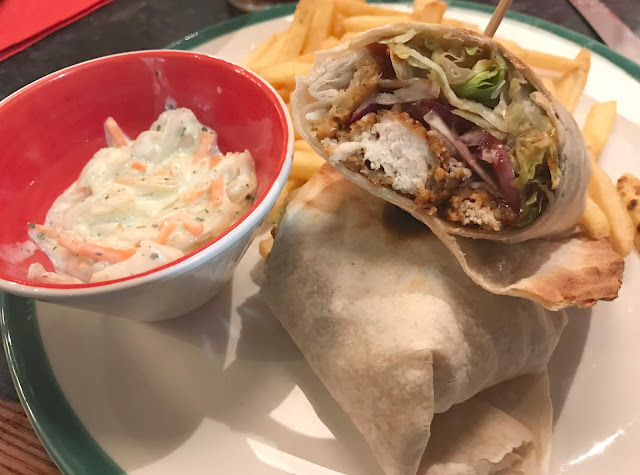 Golden fried chicken in a toasted wrap with BBQ sauce, red onion, lettuce and cheese and served with a side of fries and pot of slaw. It was delicious as always and I don't regret ordering the same as always as I enjoyed every mouthful. 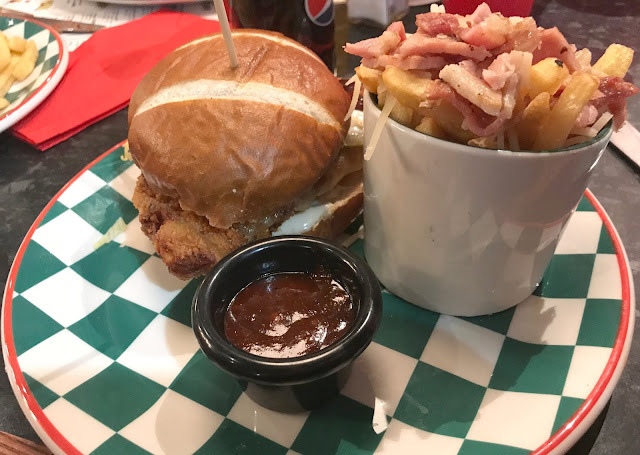 The other half normally orders pasta but decided to get a burger for a change, ordering the Nashville hot chicken burger (£12.99). 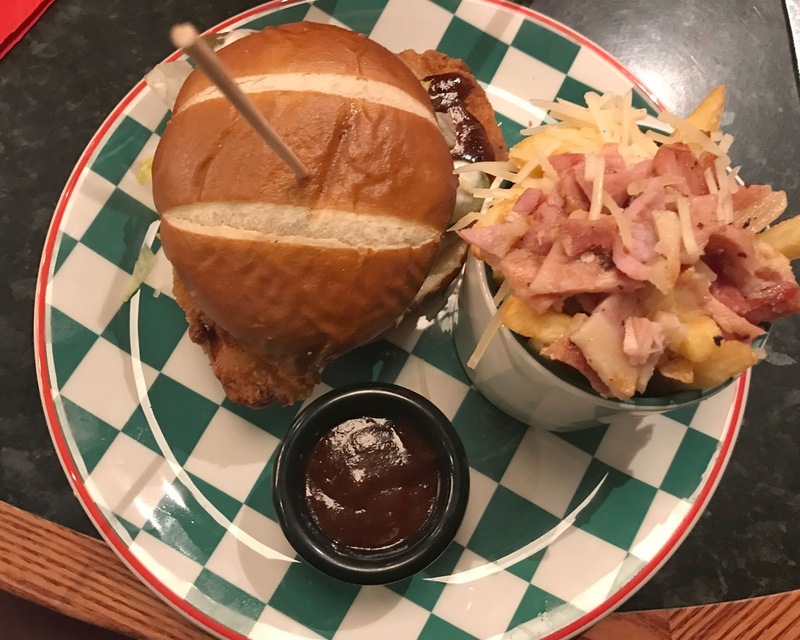 Breaded buttermilk chicken breast with Monterey Jack cheese, gherkin, lettuce, Nashville hot sauce and mayo in a bun and served with fries. 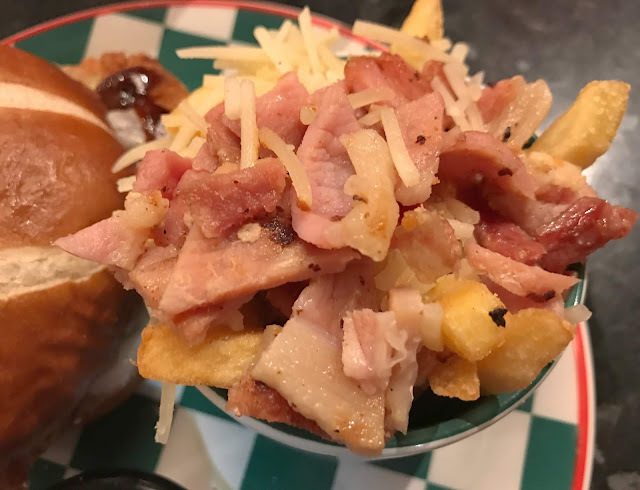 He upgraded his fries to cheese and bacon fries (extra £1.29) and really enjoyed his meal, although he did say it was spicy. We were all really full by now but of course, we had to order dessert, the little two ordered from the children's menu as dessert was included in the price of their meal. They both ordered the warm mini waffles which were half a waffle served with vanilla ice cream. 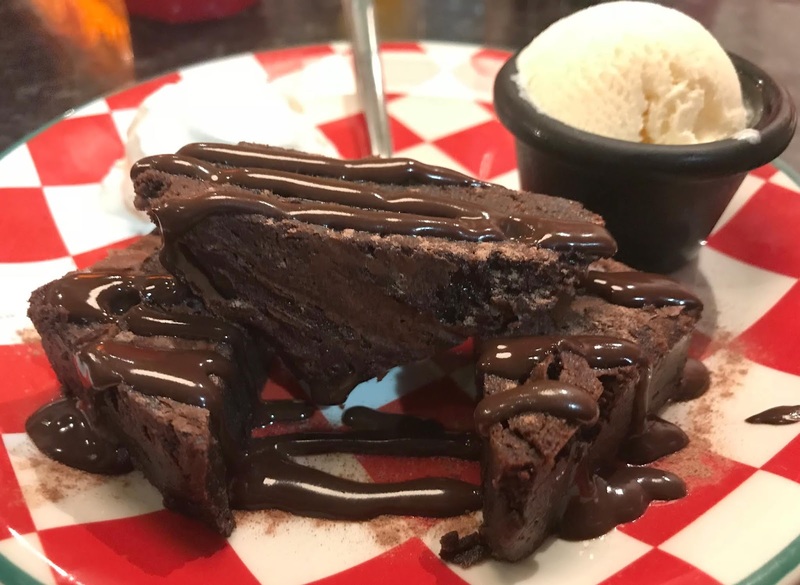 My teen ordered the Brownies and Ice Cream (£5.59) this looked delicious. 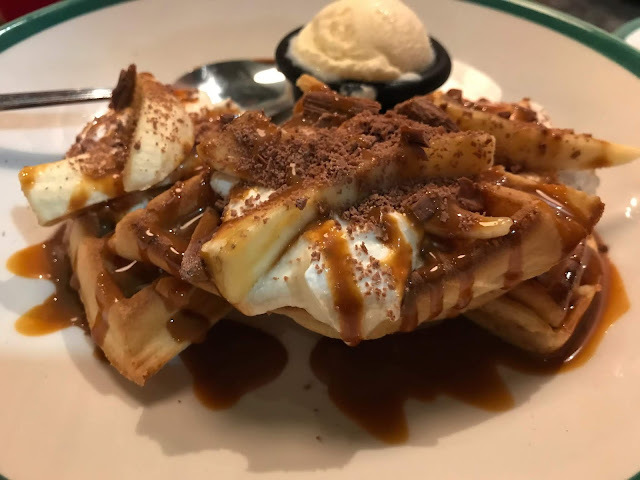 The other half ordered the Banoffee Waffle (£5.79) and was a warm waffle, banana, toffee sauce, crushed chocolate and ice cream. I am not a fan of waffles but it looked delicious. I ordered off the small delights section as I was too full to eat a whole pudding, ordering a mini blueberry cheesecake (£2.99) which was perfect for if you want a pudding but won't eat a whole one. 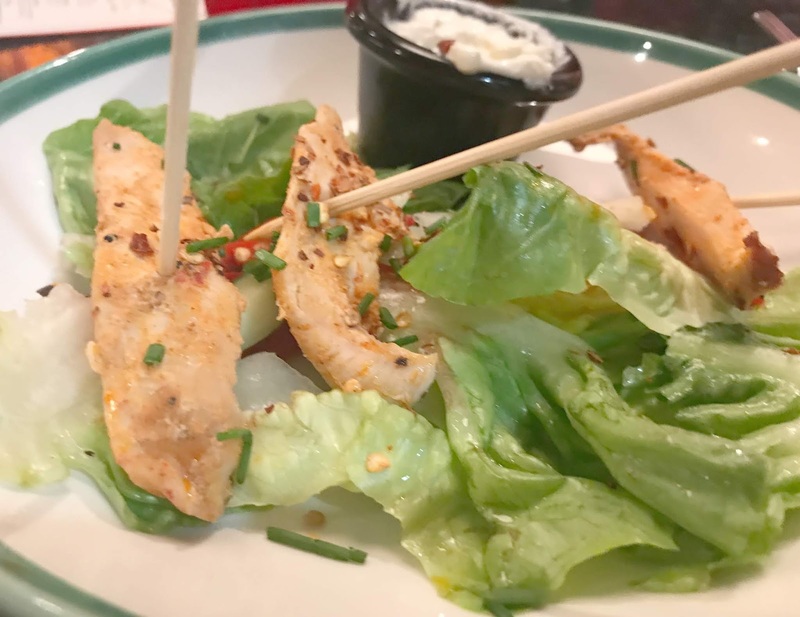 We all really enjoyed our meal at Frankie & Benny's as always, in all the years we have eaten at Frankie and Bennys we have never had a bad meal if I am honest. The service we received was amazing as always, but special mention to our server on the day who was so friendly and lovely with the children. I am always aware when we go to review places that staff are aware we are reviewing but she was lovely with every customer in the restaurant not just us. If you are looking for somewhere to eat next time you are in the Metrocentre then Frankie & Benny's is well worth a visit. The children's menus are amazing value and if you order from the lunch or fixed price menus you can get a very reasonably priced lunch deal. They also offer a family pizza and pasta meal deal too which seems good value and which I think we will try next time we visit. What is your favourite meal when you dine at Frankie & Benny's? Disclosure We were provided with a complimentary meal for the purpose of this review, however, all opinions are my own. This looks so good. 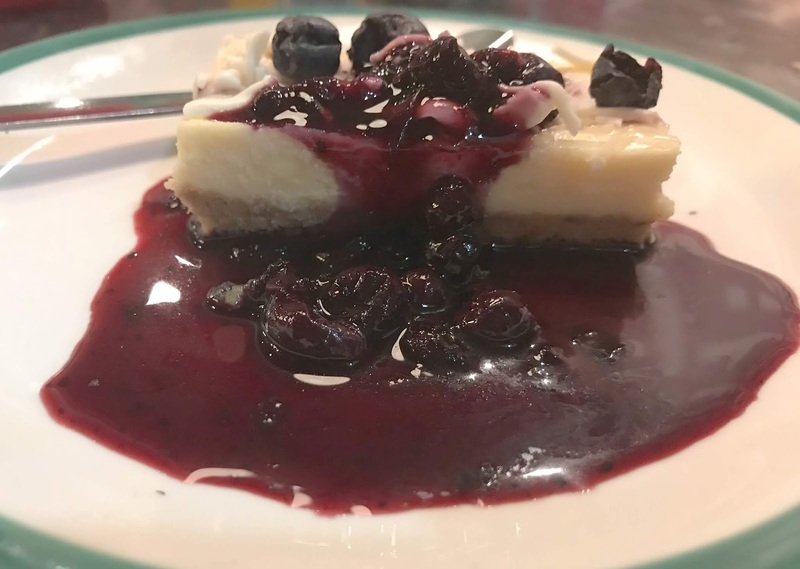 We love to eat at Franki and Benny's. I love the chicken and bbq sauce. They do great meals and drinks. Franky and Bennys! Now that's a blast from the past. It used to be one of our favourite places to hang out after the movies a very VERY long time ago. I remember the garlic mushrooms being delicious. Your meals all look fab! Frankie and Bennies has become a bit of a birthday tradition for my little boy! We will have to try it out again (any excuse)because I dont remember my dessert looking this awesome! This looks delicious. It’s years since we ate at Frankie and bennys. This sounds great, I always loved Frankie & benny’s when I was growing up & will have to give it another go! The food looks lovely.